In the 2007 movie, The Bucket List, Morgan Freeman and Jack Nicholson are two terminally ill old guys who want to jump out of airplanes, drive race cars, get tattoos and motorcycle on the Great Wall of China before they “kick the bucket”, an old euphemism for dying. Now the term “Bucket List” is synonymous for living out your dreams before the end of your journey on this planet. 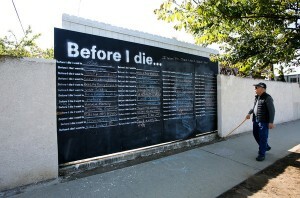 That’s why we were intrigued with this article in the April 15th LA Times, “Giant chalkboard invites ‘bucket list’ wishes in Westchester.” According to the article, Elliot Kharkats put a chalkboard with Before I Die on it on the back gate to his house along with chalk that lets passersby write what they’d like to do before they move off this mortal plane. Kharkats apparently got the idea from another he’d seen in San Diego and it seems this phenomena is spreading across the country. He erases the chalkboard every week to give others a chance to state their desires. The concept of doing something you’ve always wanted to do before dying is certainly not new, but sharing it is ubiquitous in the age of social media. We think there’s value to letting the world know your bucket list because it plants action into your words. As the self-improvement gurus, and research supports, writing things down helps you achieve your goals. A written goal brings clarity, focus and direction. A written goal is a powerful reminder of what’s important to you and allows you to stay on the right path. The constant reminder of a written goal keeps it front and center in your mind, which means you’re more likely to take steps to achieve it. Consider the often-told story of a man on his deathbed being visited by who he thinks are his friends coming to say goodbye although the doesn’t recognize them. He asks them if they’ve come to see him off and they answer that no, they represent what he always wanted to do but never accomplished. So what’s on your bucket list? Go on a vacation to Europe or Tahiti? Build that dream house? Have children? Start a business or write the Great American Novel? Whatever it is, you don’t want to end up at the end of your days erasing your chalkboard and regretting what you always wanted to do but didn’t.